QC What is new on the Website? Queen's College, Stourbridge, Worcestershire first opened its doors to pupils in Elizabeth II Coronation year, September 1953, by the Principal and owner Johnson Ball. It was initially housed in ‘The Mount’ Red Hill, later expanding to incorporate the neighbouring property 'The Hollies' as the popularity of the college increased. The lack of suitable facilities on the site such as an Assembly Hall and Gymnasium and the ever increasing student intake prompted the move from Red Hill to Chawn Hill. 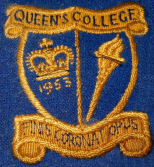 In 1958 Queen's College moved to the former Georgean residence of Ernest Stevens [Manufacturer and Stourbridge Benefactor]. Prescott House was a much larger property set within 10 acres and more suited to the expanding college. However, seven years after moving his College to Chawn Hill. in 1965, Johnson Ball closed Queen's College giving reasons of difficulties in recruiting teaching staff and the deterioration of his own health. This website [established in 2011] is the only known existing 'archive' for Queen's College, Stourbridge, Worcestershire, UK and has been compiled from contributions from ex QC's and research undertaken by the QC Webmaster. If you can help improve and expand the QC website please contact the QC Webmaster. We are keen to make contact with ex pupils and Staff. Queens College - Prescott House and grounds, Pedmore.